Ho-Ho-Ho... hum? Is this a holiday collection or a great starter-stash of shades? Huzzah! Check it out! 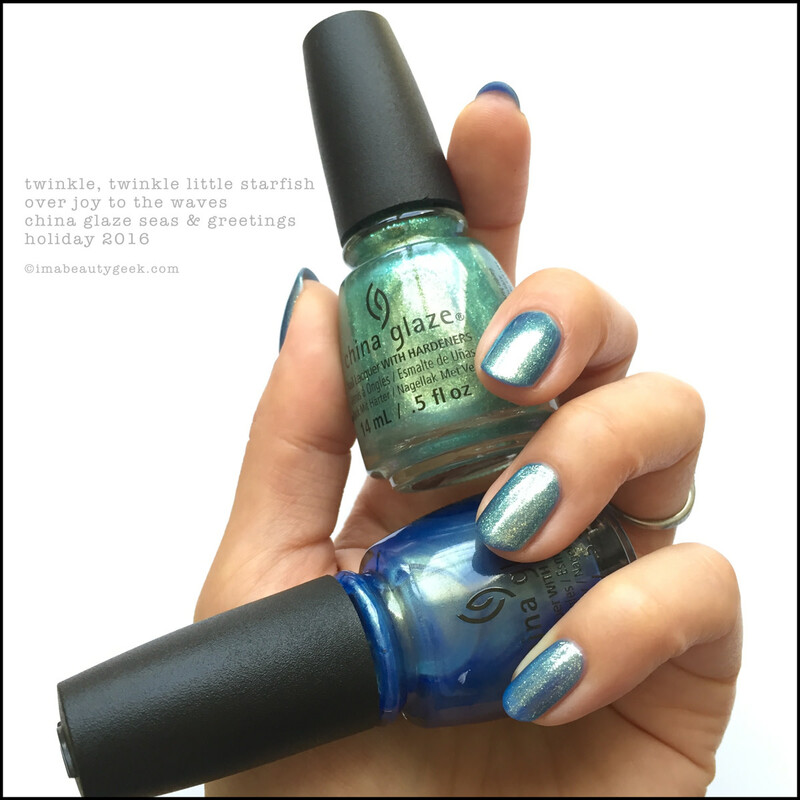 I bought the entire China Glaze Seas & Greetings Holiday 2016 Collection from Sparkle! I swatched ‘em all and wrote stuff down so I could share it with you! Wanna see? China Glaze Sand in my Mistletoes (above). You’ll have to watch out for gravity on account of that loooong stem. The formula is a little on the thick side and stopped me from doing 3 coats. But 2 thick coats gets the job done in a pretty okay way. In my estimation, it’s a weird choice for a holiday collection. Just sayin’. China Glaze Eat, Pink, Be Merry (above). ...here! The cinnamon shimmer really shows under 100% artificial light. She’s kinda sheer in 2. I should have done 3. Oops. 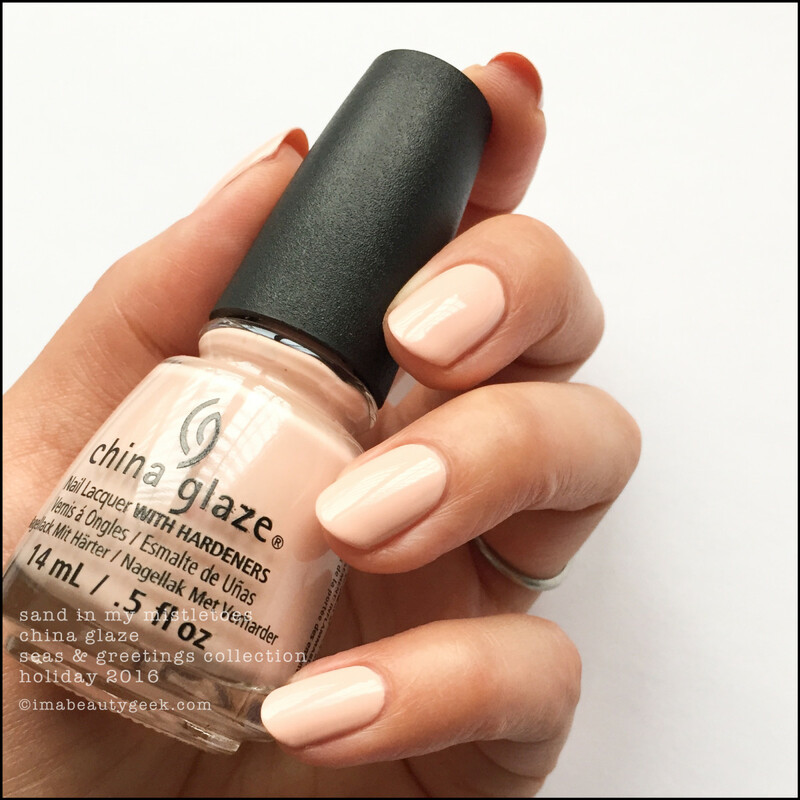 China Glaze Let’s Shell-ebrate over Eat, Pink, Be Merry (above). That’s 2 coats of the glitter stuff over my 2 coats of the pink stuff because hey, why not? The payoff isn’t spectacular so if you’re going to try for a full Let’s Shell-ebrate mani, you’re going to need to do more coats – or use a sponge. She dries with a glitter texture so top coat for a smooth finish, yes? 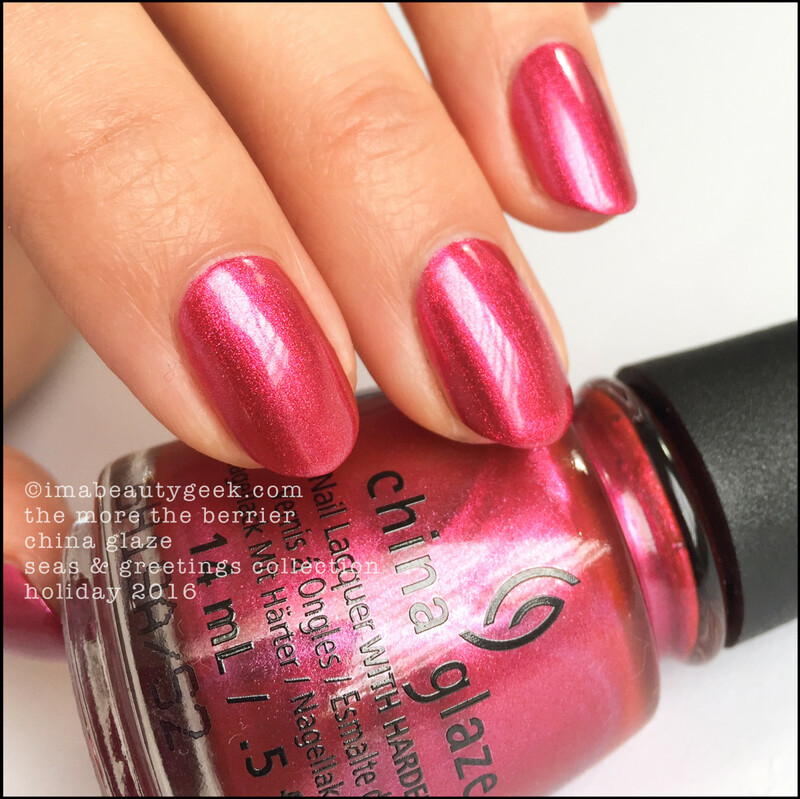 China Glaze Let’s Shell-ebrate over Eat, Pink, Be Merry (above). With top coat. You know, because I can. Also because sometimes I think things look better when they&apos;re not right up in your grill. 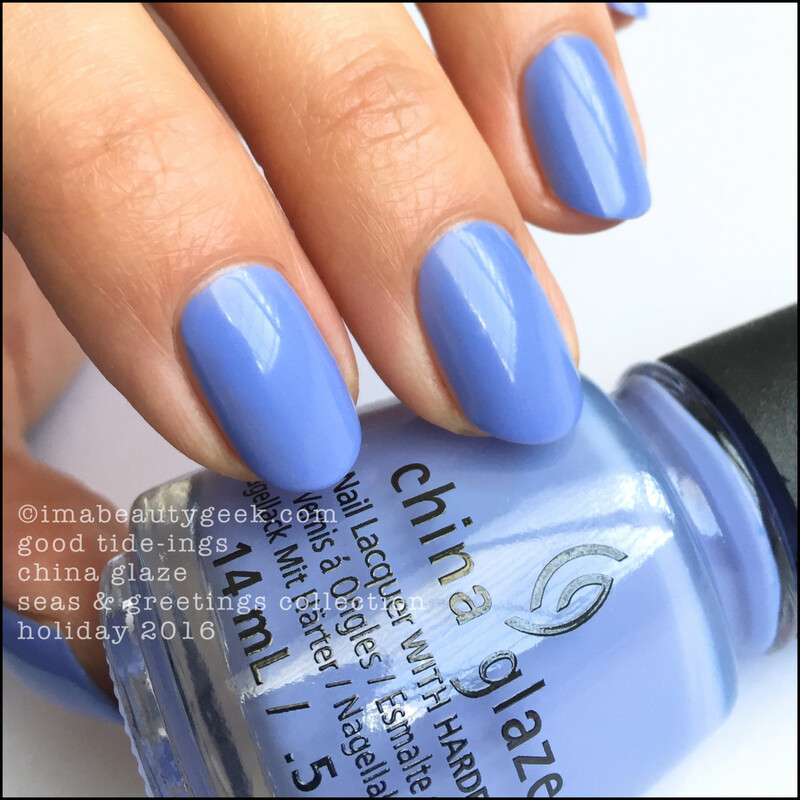 China Glaze Snow Way! (above). Huh. That’s 2 coats and in 100% natural light, I think there’s a pearly-ish opalescent thing going on. It’s SO much pretty I really didn’t want to take it off. 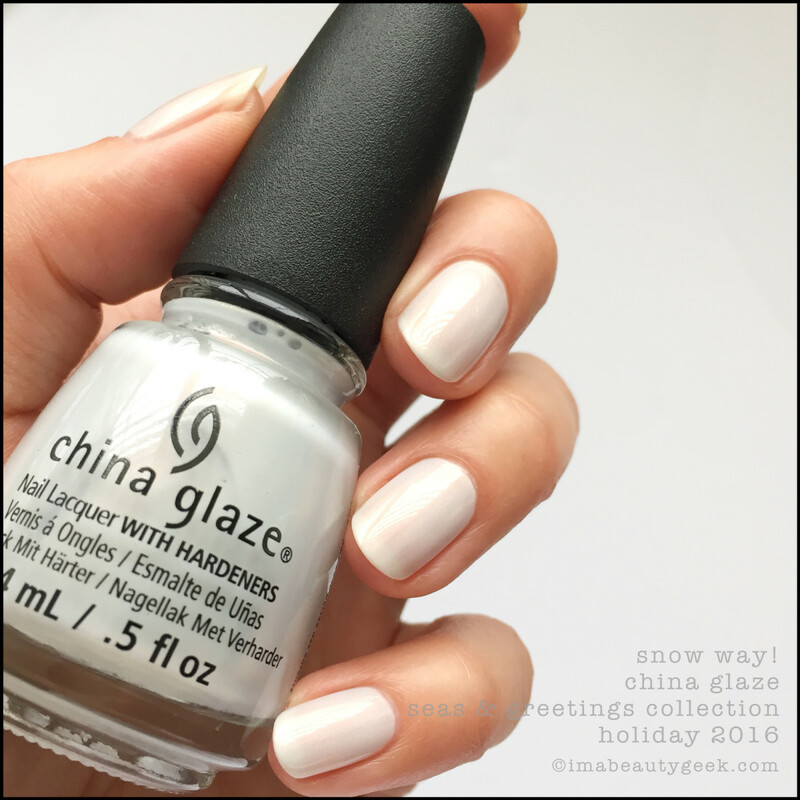 China Glaze Snow Way! (above). If I add in some desk lamp with my natural light, maybe it’s even a pink pearly thing in a sort of pale bluey-grey polish? Aka iridescence. 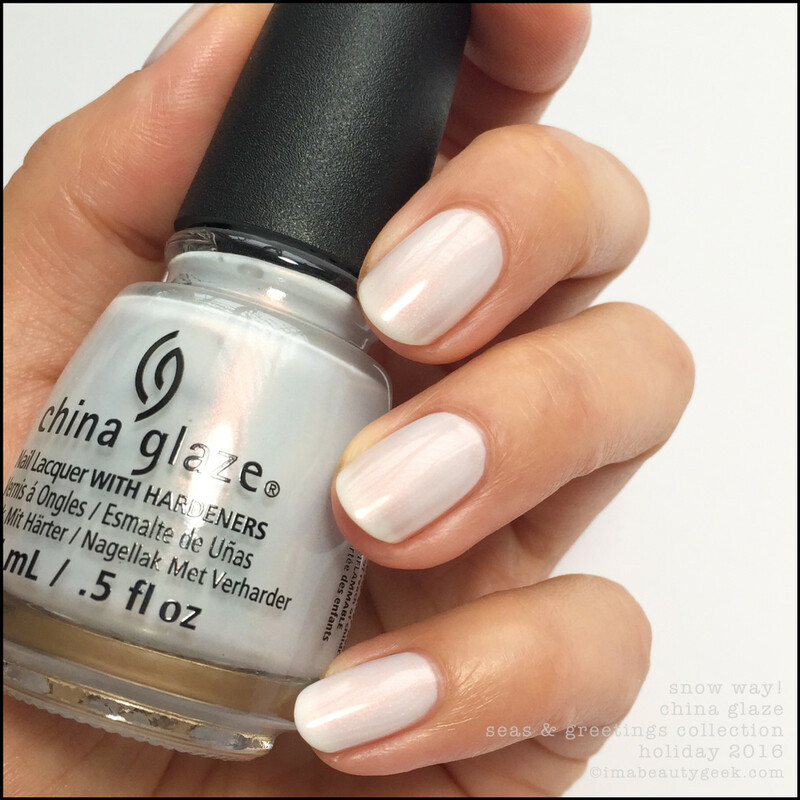 China Glaze Snow Way! (above). Yep. In 100% artificial light, there it is. Hmm… it reminds me of something… But wait! I gotta show you this! This is fun! China Glaze Regular Brush vs My Snow Way Brush (above). Oh yes, you’re seeing that right. My Snow Way! 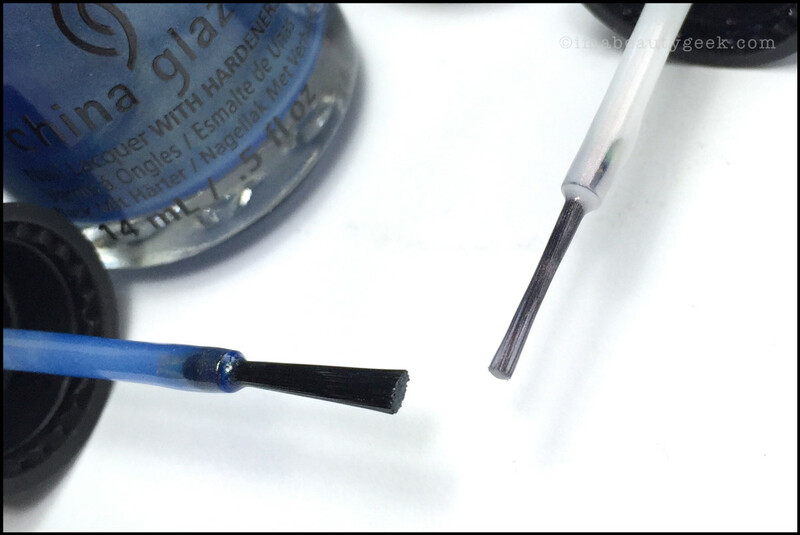 brush was ½ the size of the regular already-skinny China Glaze brush! It was like painting with a striping brush. I stopped at 2 coats because even for me, 3 would have been a challenge. I did let Sparkle know about it so they could check their other stock – if you order from there, you should be good to go. They did offer to replace it for me, but I said "no." I’m a glutton for punishment, huh? China Glaze Good Tide-ings (above). That’s 2 coats where I should have done 3 – or maybe 2 thicker ones. The camera really sees things my eyeballs don’t and I hate that! I can now see I have some slightly thin areas down the sidewalls. I didn’t notice before. Grrr. Oh – I should tell you this: don’t shake the crap out of this right before you use it. If you do, the bubbles get stuck in the brush and end up on the nail. Learn from my mistakes, friends! 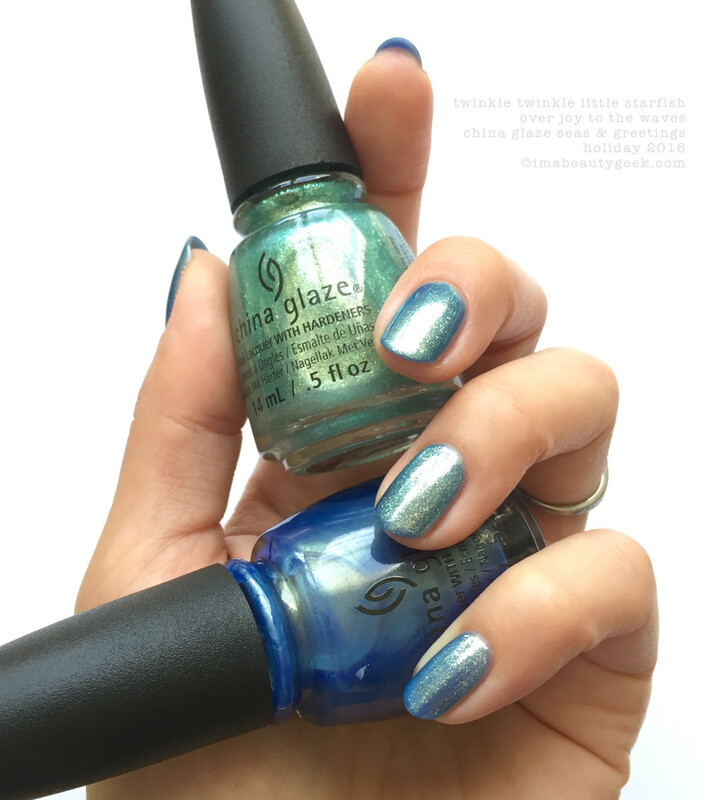 China Glaze Joy to the Waves (above). This pretty blue flashy thing will easily require 3 coats to erase all VNL. She’s got a supremely retro-esque finish that I’m kind of crushing on. China Glaze Partridge in a Palm Tree (above). Matte? 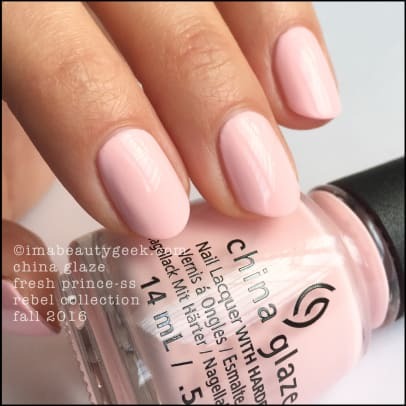 Why China Glaze? I mean I know you just came off winning all the things with your Formula X Prophecy dupe Combat Blue-ts, but that doesn’t mean you should just add mattes to your collections – especially if they’re not great formulas. If you love this shade and have an extraordinarily light hand with polish, I say go ahead and get one. You&apos;ll need speed, accuracy, and possibly a couple drops of thinner. Ugh. This actually gives me shivers, and not in a good way. China Glaze Twinkle Twinkle Little Starfish over Partridge in a Palm Tree (above). Okay fine. I made the Partridge work and it’s now pretty swell. The addition of this sheer top coat with the golden-green flecks takes care of the uneven mess underneath and almost redeems it. Would I buy Partridge just to make this combo happen? No. Just no. China Glaze Twinkle Twinkle Little Starfish over Partridge in a Palm Tree (above). One more time so you can maybe see other potential uses for the Twinkle? China Glaze Twinkle Twinkle Little Starfish over Joy to the Waves (above). Like maybe you can slap it over blue! Ooooh! 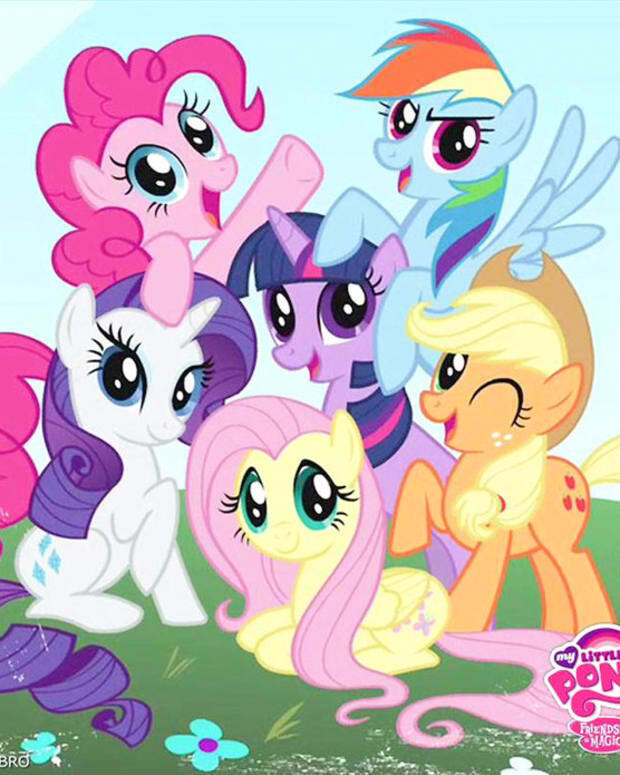 Sparkleshimmerz! China Glaze Seas and Greetings (above). That’s 2 coats. She’s kind of sticky but still fairly easy to work. A wider brush would have been my choice but we make do with what we get in the bottles, right? She’s old school-y and I must say I’m loving this return to these sorts of shimmers. It makes me smile. China Glaze Seas and Greetings (above). In different lights, she can get more or less violet. Pretty all the ways! 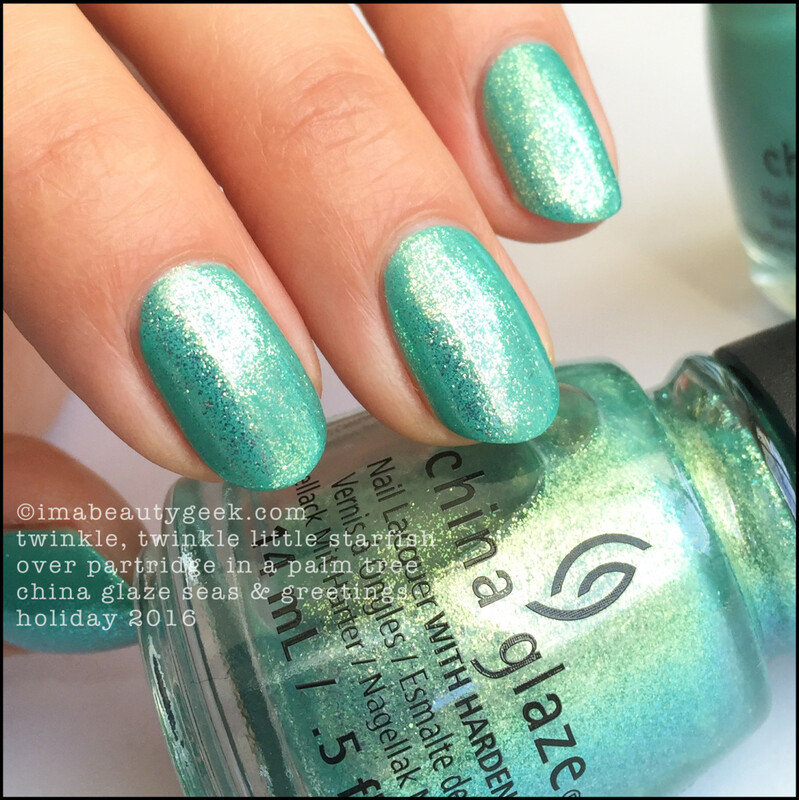 China Glaze Tis the Sea-sun vs China Glaze Warm Wishes (above). Wow! (Insert sarcasm here). I couldn&apos;t help myself! It&apos;s just so much Holiday 2016 packed into one photo! 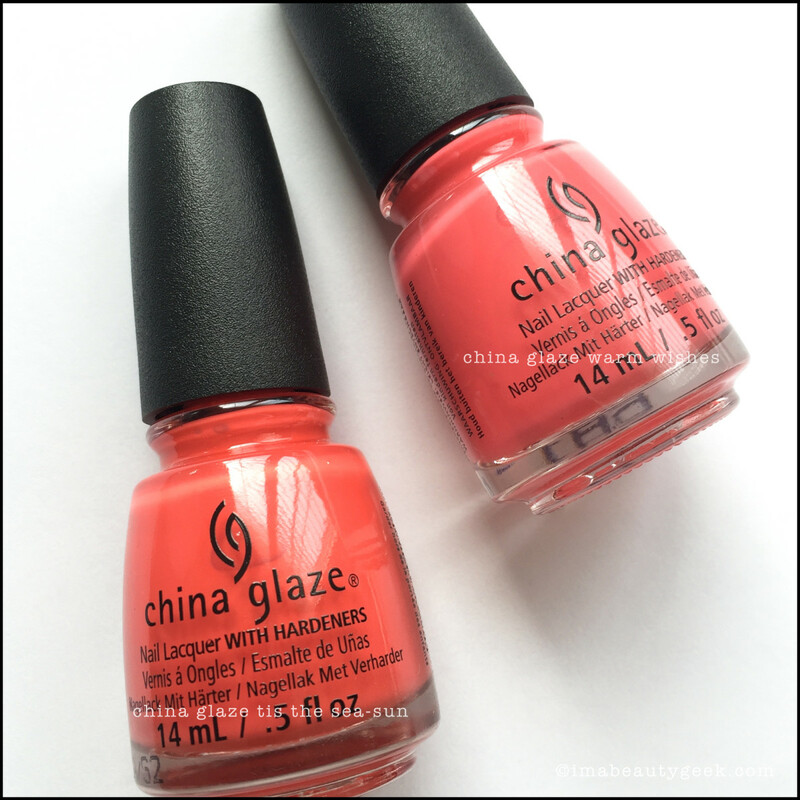 China Glaze Warm Wishes (above). 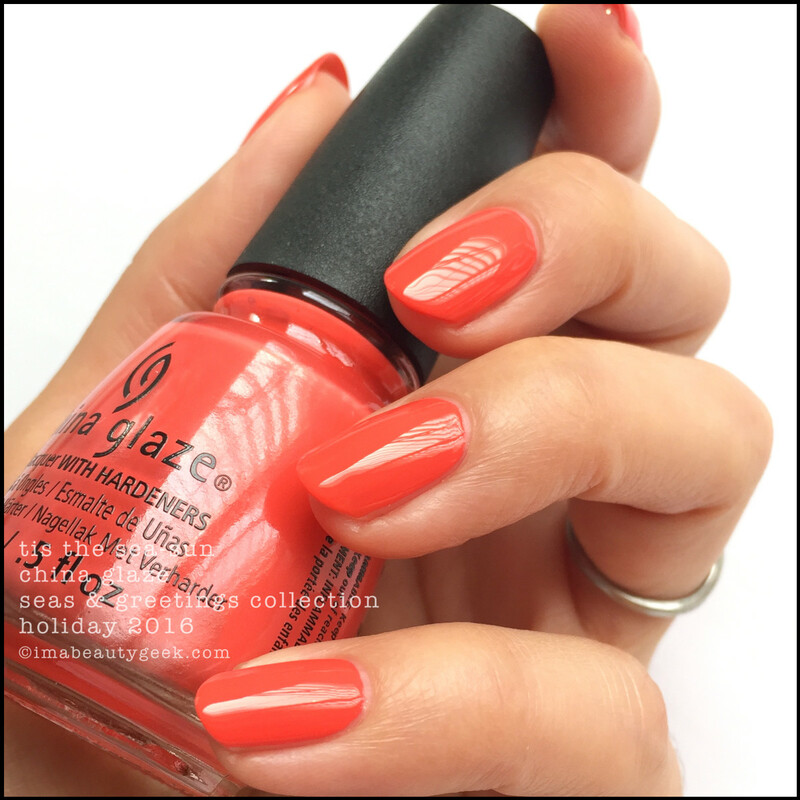 That’s 2 coats of this festive coral-leaning pink. The formula is a tiny bit thin so you’ll need to be careful and maybe underload your brush a bit to get the best coverage. 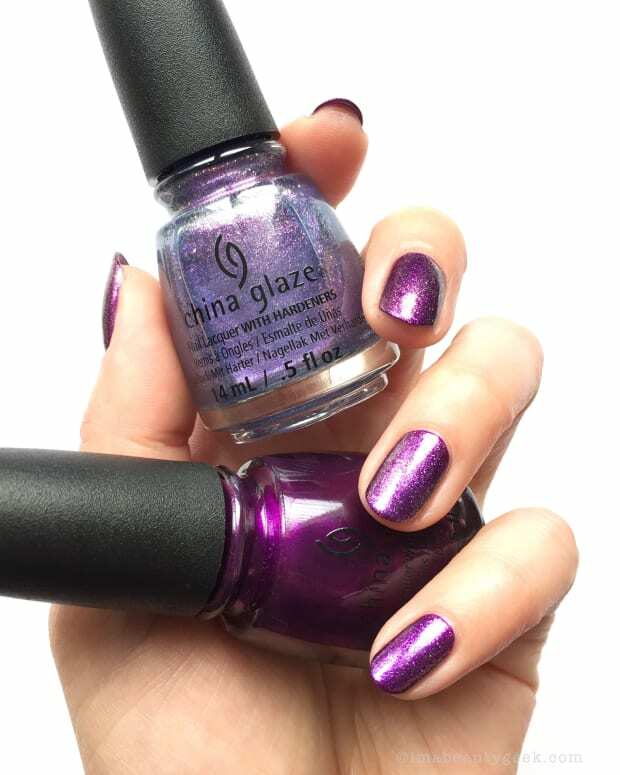 China Glaze The More The Berrier (above). Finally, there’s this crazy-lit shimmer-berry that I love. 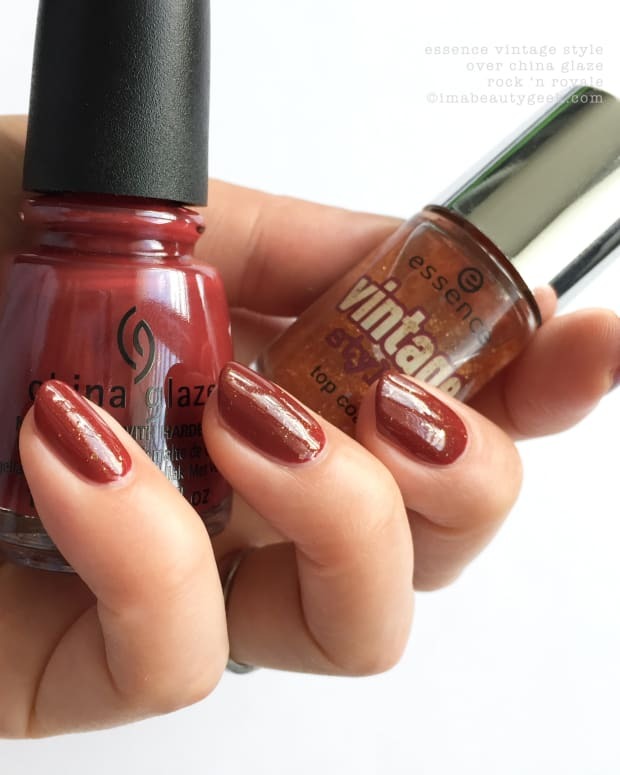 You can totally do this in 1 coat, but you’re a pro and deserve a perfect mani so do 2 coats for full awesomeness. All that embedded shimmer wins all the Holiday things. ALL. It’s mines. 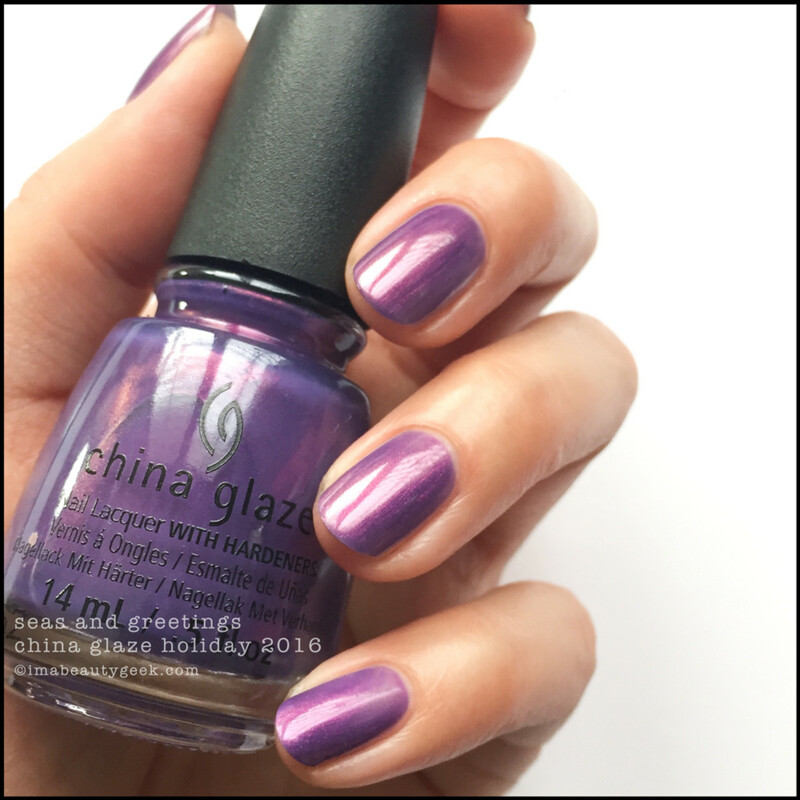 And that’s it for the China Glaze Seas and Greetings Holiday 2016 collection. It can’t just be me that’s not feeling the “holiday” part of this can it? I mean don’t we already have summer collections with shades like these? Do we need to carry them into Holiday where everything should be about glitz and glitter? To me, this assemblage feels like leftovers – like things that maybe they thought about for summer and bypassed in favour of the Lite Brites. To me, as a whole, it’s simply a confused collection that I just can’t get behind. Wait! On the other hand (because I really should play Devil’s Advocate), if I look at this from a non-holiday, new-to-nails perspective, a lot of it is pretty swell if I’m trying to build a solid core collection. There’s a definite retro feel (with up-to-date, safer formulas) in a handful of these shades, and I think for a lot of new polishers, that&apos;s something worth having. 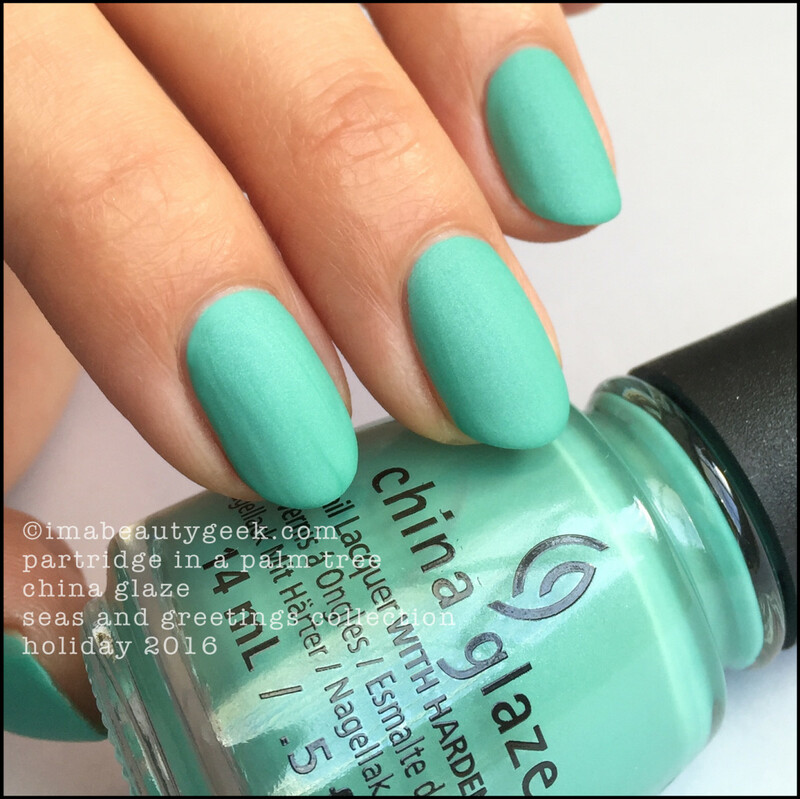 China Glaze Snow Way! 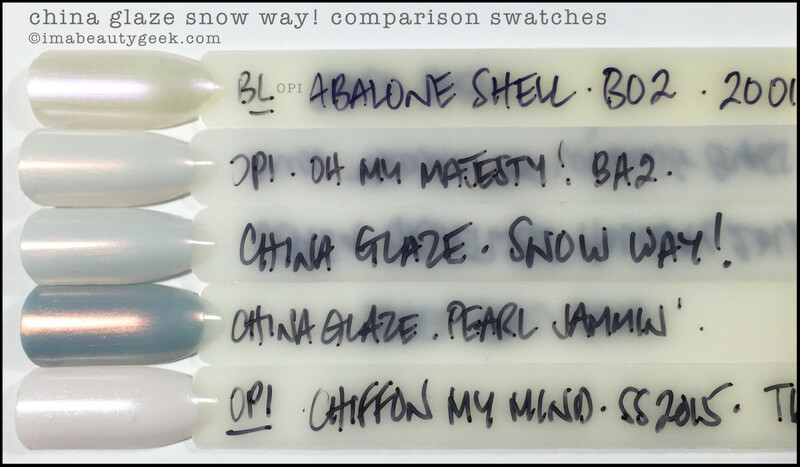 comparison swatches (above). You&apos;re welcome. Shall we chat now? You must have thoughts and you know I love to hear thoughts! Tell me what you think! Tell me if you think I&apos;m nuts to not adore this collection! Tell me what you&apos;d buy! Tell me what you 100% won&apos;t. I wanna hear all the things! 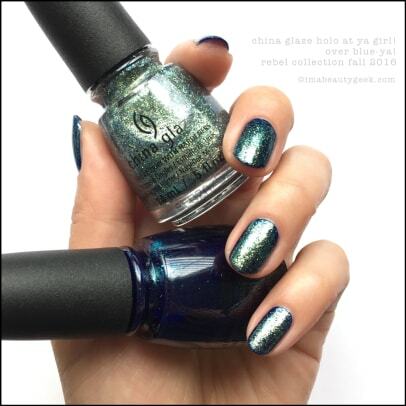 If you missed out on my love affair with the China Glaze Rebel Fall 2016 Collection, here, have a slideshow! Manicures & Photos by Karen Falcon (she broke her salad spinner - and not on purpose).